Several young people line up to get a hot meal at the garden on Rue Pali-Kao on Thursday, March 7th. Credit: Maëva Poulet / InfoMigrants. Several times a week, the Midis du Mie collective organizes lunch distributions for unaccompanied foreign minors in the garden on Rue Pali-Kao in the 20th arrondissement of Paris. These meetings draw youth who are dealing with complicated administrative procedures, who sometimes speak little French, and who don’t know anyone in the city. The volunteers of the collective can identify them, guide them, and help the most vulnerable. Volunteers from the Midis du Mie collective have been arriving in the garden on Rue Pali-Kao, one-by-one, since 11:30 am. They plop water packs, plastic trays, cutlery, and hot foot on a ping pong table. This Thursday, couscous is on the menu. "Get in line!" At noon, they start the distribution. 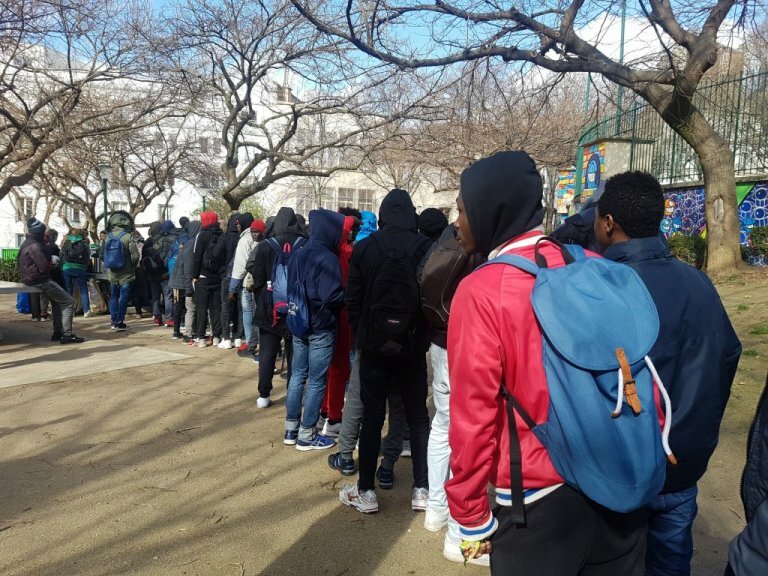 In a few minutes, a long line of young teenagers, mostly from West Africa, forms in the small park in the 20th arrondissement of Paris. Agathe Nadimi, the collective’s founder, calls out to some of them: "Moussa*, come and see me after eating lunch," she hollers. "Today, I let the team take care of the meal, I have young people to see," she explains to InfoMigrants. For more than two years, the collective Midis du Mie - which now has more than a hundred members in Paris – has been helping young and very young unaccompanied minors, who are often lost administratively - or linguistically - in the French capital. Some are left to their own devices, alone, with no place to sleep. Others have a roof but have little help with their efforts. Others are "almost out of the woods" but take advantage of this moment to meet other young people with similar backgrounds, play football, or help those who don’t speak French yet. It's not just about eating here in the garden of Pali-Kao Street. This "spot", as Agathe calls it, is an anchor point for these foreign minors. Held every Thursday, Friday, Saturday and Sunday, these lunches allow volunteers to identify newcomers, to determine which are the most vulnerable, to advise them, to reassure them and above all to follow them over the long term. All the kids here are in extremely difficult situations. For the most part, they were rejected by the Demie 75, the system of evaluation of unaccompanied foreign minors, managed by the Red Cross. It is this entity that assesses young migrant’s age and sends - or doesn’t - their file to the Social Assistance for Children (ASE) the body in France responsible for their care. Often, young minors are deemed to be of age by the Demie 75 and thus find themselves on the street, without options. In that case, they are allowed to take legal action. But they still have to know how to do it. In February, Les Midis du Mie counted 111 young people who declared themselves to be minors and who were rejected. But Agathe believes that the real number has to be twice that: "We do not know them all. Some sleep in parking lots in La Défense, or in the bus station at Bercy or Gare du Nord." Across the entire French territory, the number of unaccompanied minors has tripled in two years, reaching 40,000 who had been accepted into the system at the end of 2018, according to the assembly of the departments of France (ADF), which is calling for more government funds to deal with inadequate and saturated centers. This Thursday, almost 250 young people have come to the meal distribution. It was the same thing the week before. Among them, the scenarios vary. Lamine* is being housed in Bobigny. He comes to the garden because he feels homesick in his hotel room: "Here, I see the world, it feels good". This 14-year-old Guinean has been recognized as a minor and is waiting for his "transfer" to the child welfare structure that will take charge of him. Next to him is Elisha*, also Guinean, is said to have arrived in Paris on Sunday and to be sleeping in the street because the Red Cross deemed him to be of age. The group tries, as best they can, to accommodate young people in that situation. The collective Assojemip-Couronnes pays for three double rooms at a hotel each month. A citizen accommodation system, piloted by the collective, can provide accommodation for a hundred minors. "Without that, for them, it's the street," says Agathe. The young people who declare themselves as minors are not eligible for emergency shelters. Near the ping-pong table where her team is serving the last meals, Agathe takes the time to have a word with several young people. A volunteer introduces her to Idriss *, who was turned away from the Demie 75. Agathe asks him where his letter of refusal is and explains that the juvenile court will ask him if he wants to appeal. Idriss replies that he has the documents "at home". The young Ivorian says that a man, a pastor, is taking care of him. "Is that gentleman nice to you?" Agathe asks again. Idriss nods, but loses patience. "What should I do?" he demands. It is past 1pm. The meal distribution is over and it is starting to rain. Some of the young people have already left. Others are still there, sheltering under a slide. "Come with us," several of the volunteers tell the kids. An association has been temporarily loaning Agathe a hall across from the garden since December. Every Thursday after lunch, volunteers bring over those who want to try on clothes. There are also organized activities in the afternoon in the hall, which is warm and sheltered. The youth can also get jackets, underwear, SIM cards, small mobile phones, as well as toiletries in the back room. Agathe talks with a young man who seems tired and extremely lonely. "You have to make friends here,” she tells him. “What language do you speak? Bambara? We are going to help you make friends". A volunteer invites them to come the next day to Centquatre, a cultural center in the 19th arrondissement, to see dancers. Agathe adds that a cultural outing will soon be organized on a Sunday. "We must also be able to offer them nice activities," she says. Apart from being recognized as minors, many of these young people can not go to school. So for them, the days alone in Paris are long. * All names of the minors have been changed. When? Monday, Tuesday, Wednesday from 10 am to noon. Where? Rue du Moulin Joly, next to the Red Cross. Metro: Couronnes, Line 2. When? Thursday, Friday from noon and Saturday, Sunday from 12:30 pm. Where? The garden on Rue Pali-Kao, below Belleville Park. Metro: Couronnes, Line 2. When? Every Thursday, after the Midis du Mie lunch distribution in Rue Pali-Kao. Where? Opposite the garden on Rue Pali-Kao, 5 rue de Tourtille, 75020 Paris. Metro Couronnes, Line 2. - Those who wish can drop off clothes for young people at "Belleville Citizen", 18 rue Bisson, 75020 Paris, Wednesdays and Saturdays from 5 pm to 7 pm.